This Confederate Cavalry Officer Saber was the sword held high by Confederate Officers charging into battle. Detailed with a fine etch on the 31 1/2" high carbon steel, hand forged blade with leather handle with wire wrap and solid brass guard. Also includes classic leather wrapped steel shaft. This is a excellent recreation of a 1860's saber. I actual reorder anothe saber as a gift for my brother, another history buff. No other offered saber can match this one for value vs cost. A pretty good sword. 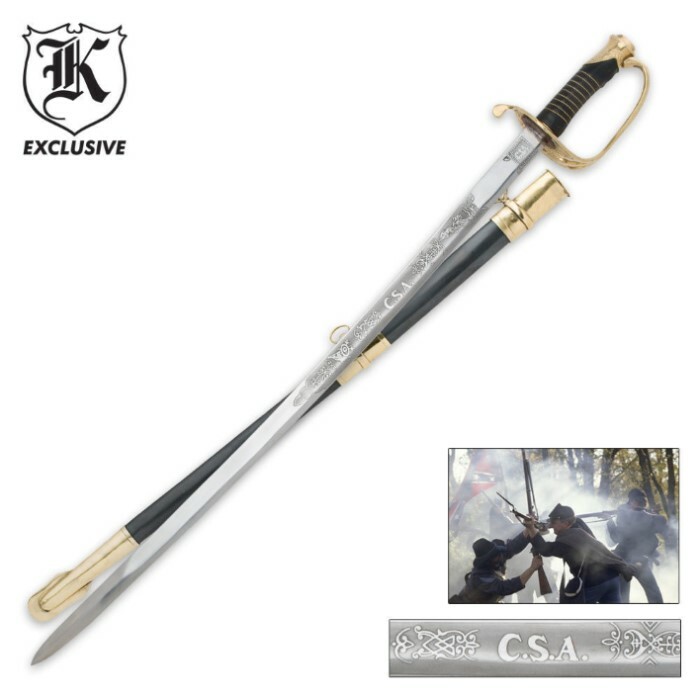 Just a couple of quirks.. For one it say it's a confederate sword But I got a union. The paint on the scabbard chips, and the topper thing at the end of the sheath was loose. But the blade doesn't wobble and it is pretty sturdy. I like the weight and length. Overall it is a great buy. Bought this as a gift and was very impressed by the quality and detail. Looks great, wasnt sharpened but that was expected. Only a small imperfection on the leather wrap on the handle but over all very satisfied. this is an amazing sword very well worth the price, shipped in amazing condition a little heavy but still worth it, a must buy. This sword is a beautiful piece of art, its awe inspiring and deserves to belong in a museum. The blade is very long to boot! The only problem I have with it are two things; The blade is a bit on the heavy side, and the blade is considerably hard to unsheath when you first draw the Sabre, but after a few days of drawing it and putting it back, it would come eaiser. I bought this for my dad as a Christmas knowing he would like it. And I would have to agree, the sword that was sent to me is a nice piece of work. Nothing wrong with it what so ever. I suggest that you buy this sword and add it to your collection, it's worth the money spent.